"Around the world, familiar routines shape our days and weeks: waking, washing, dressing, eating and, for many people, praying. Whether Islam's Friday prayer, Judaism's Saturday Shabbat service, Christianity's Sunday worship, Hinduism's daily puja, or Buddhism's mantras, religious rituals are marked by distinct practices and beliefs, but do they share something more fundamental? And when you're too young to fully grasp the tenets of your religion, what significance do they hold? 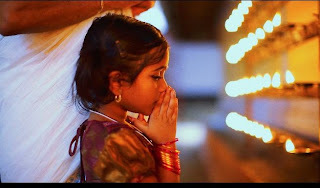 Observing the spiritual rituals of five children aged five around the world, Five is a brief, wordless reflection on faith, prayer and the rites that can bind us."